Brian Houghton with "The Last Unicorn" (right) and "The Last Valkyrie," both of which are hanging at Stella's Cafe in Spokane. The look on Brian Houghton's face when he opens the door at Stella's Café on a Saturday morning is guarded yet curious. Or perhaps he's just tired. Weekends are typically for making art, but today he's back where he's worked as a line cook since the café opened in 2012. While co-workers prep for late breakfast or an early lunch, Houghton ambles past exposed brick walls covered in artwork by Spokane artists Chris Dreyer, Devon Plopper and Cole Tanner. 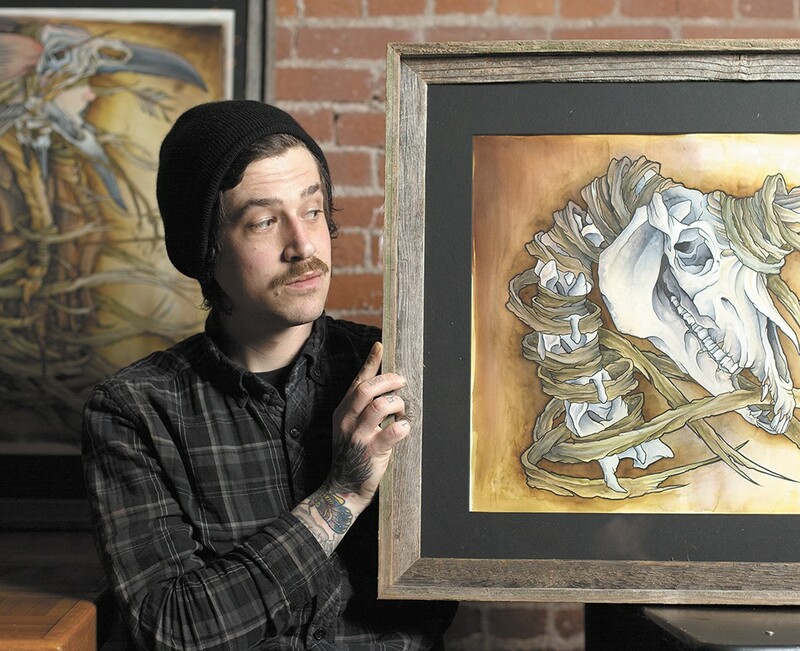 His own artwork has hung there, as well as at Terrain and assorted venues throughout Spokane, for the past three years. "I literally was just messing around," he says of his first painting in 2011, a Star Wars droid he made using exactly what he had on hand: black spray paint, a white paint pen, red and grey acrylic and cardboard. "I do what I like," he says. No agenda, although he's a fan of Hi-Fructose and Juxtapoz magazines, and that influence comes through. More pieces depicting pop culture figures followed, then some sad-faced balloon figures of hybrid animals and dinosaurs, and later some increasingly complex watercolor paintings spanning Houghton's varied interests in religion, mythology and anatomy. And then came more dinosaurs in Copic marker, mixed-media-on-plywood robot hybrids and action figures that look like they belong on Rudolph the Red-Nosed Reindeer's "Island of Misfit Toys." "If I'm able to make some money with it, then fine," he says of his artwork. "If I don't, then I'm not going to lose any sleep over it." Under the moniker Aura of Moths, he's launched a successful line of jewelry on Etsy combining bones, crystals, antiqued wire, bullet casings and other items. "It was challenging at first," says the self-taught artist, who sold most of the jewelry but has since stopped making it. He tends to immerse himself in something and work it until he's taken it as far as he can, then move on, he says. Aside from an awkward few years pursuing an animation certificate from an online arts college, Houghton, 30, has learned best by just doing. And by making mistakes. Inside Stella's, three sun-flooded windows look onto asphalt and Monroe Street Bridge traffic. In the sunlight, Houghton's eyes are olive-gray, matching his jacket. He's not wearing his trademark nose ring, but the tattoos not obscured by clothes — he has full arm and leg sleeves — suggest plenty about him. 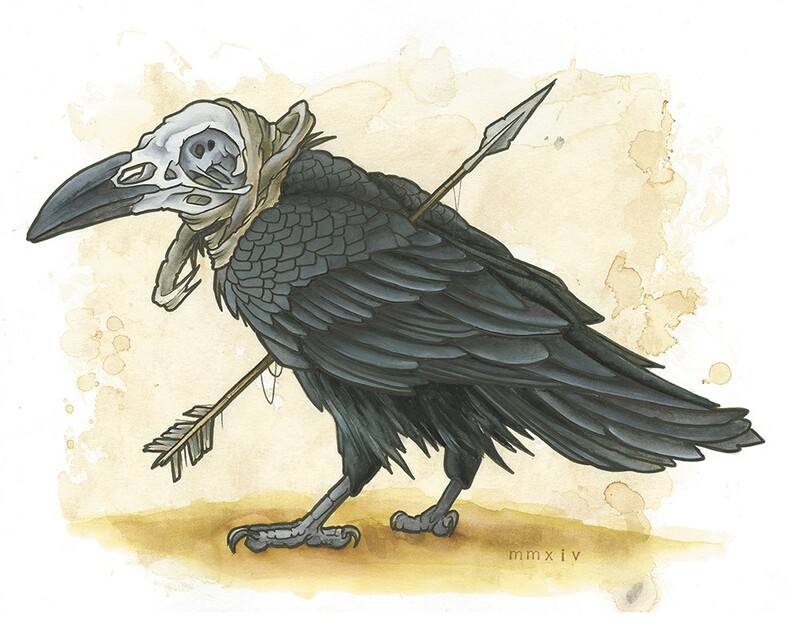 Visible are a moth, a raven's head, his name in Cyrillic letters, and on each finger, rune-like letters he did himself. "I get it now," he says. We're talking about his artwork, but could just as easily be discussing his path. He had opportunities to learn technique, including in high school, he says, but railed at the constrictions. "Alcohol was the suppress button," he says, enabling him to quiet the "noise" he says he experienced as a young adult growing up in Spokane, with so many thoughts and interests bouncing from math and science to philosophy, history and mythology. "I'm interested in how things work," he says, acknowledging that his first words as a kid were probably "Why?" and "How?" With five years sobriety to his credit (and a loyal community of support for his artwork), Houghton is looking to the future. He's considering North Idaho College for general education, then transferring to a four-year school for biology. It definitely will be a challenge, he says, but Houghton, unfazed, won't rule out continuing with art, especially if he can make a living at it.